​The international lone worker safety company SoloProtect has released a smart, new analytics feature, available in SoloProtect Insights. Analytics within Insights makes it easier than ever for customers to manage the ongoing implementation, utilisation, and performance of their SoloProtect lone worker solution. The new analytics feature, within Insights, has been designed to enhance the customer experience, providing on-demand access to a range of clear, digestible, and concise management information, displayed across three intuitive dashboards. Each dashboard offers key visual metrics, in a user-friendly manner, relating to device utilisation, user and training progress, and genuine alarm data. A lone worker manager can easily access accurate and up to date information regarding utilisation across their team. 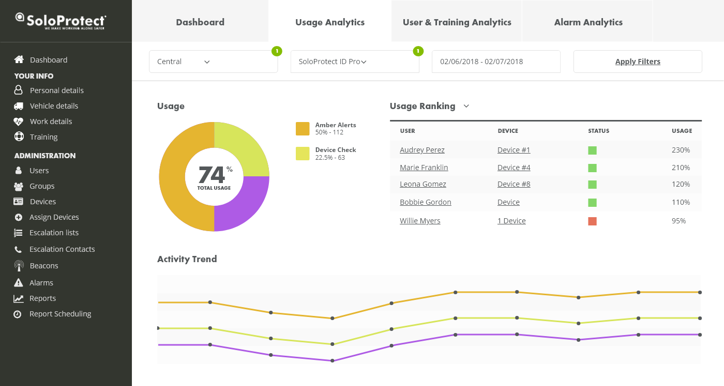 The Usage Analytics dashboard also helps address areas of training need, highlight usage patterns, and tailor reporting to suit the needs of an organisation and support ROI. With the new User & Training Analytics dashboard, solution onboarding has been simplified allowing for smooth set up of personnel, access for individual users to manage their own details, and online training support for users, accessible on PC, mobile or table device. Through the Alarm Analytics dashboard customers can monitor how alarm activity is breaking down across their workforce. They can access data covering incidences of genuine Red Alerts, incapacitation alarms, and false activations raised by their end-users. Quick and efficient deployment and utilisation of a SoloProtect solution. Considerably reduces time spent on lone worker administration, allowing for a more efficient onboarding process. Easily monitor device usage and onboarding progress with on-demand access to a range of reporting. Immediate access to genuine alarm activity. Available 24/7 across PC, Mobile, and Tablet devices. SoloProtect has delivered comprehensive lone worker protection since 2003 and is now helping employers to protect their lone working staff in over ten countries. This year has seen SoloProtect extend their solution range with the additions of several new products, culminating with the announcement of SoloProtect ID Pro.